Handle cymbals by the edges using only your fingertips. This prevents your sweaty mitts getting all over the shiny surfaces. Never stand a cymbal up on its edge on a hard floor, and make sure you have a good cymbal bag for transporting and storing. Watch out! Sweat marks and hot'n'humid gigs can lead to cymbal corrosion - an unsavoury-looking greenish staining. Cymbals often come with a thin protective coating film to guard against corrosion, but this does tend to wear off. Never try to clean a cymbal with an abrasive metal cleaner or abrasive (brillo-style) pad-however tempting it may be. Next: cleaning and polishing vs keeping dirrty! Instead, clean your cymbals with washing up liquid and warm water, using a soft non-abrasive cloth. 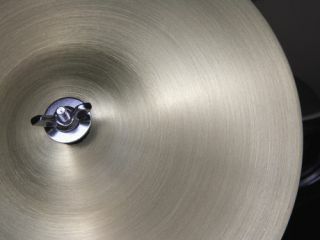 Scrub around the cymbal in the direction of the lathed grooves when you wash them and dry them thoroughly with a towel. Polish your cymbals with the manufacturers own cymbal cleaner or polish. To some extent this will restore the protective coating. Remember that different cymbal makers have different protective coatings, so it's a good idea to use their specific cleaner/polish. 10. …unless you like it dirrty! Cleaning cymbals is not a priority for everybody - some feel cleaning affects sound and prefer them dirty.